Problem: A company with over 1000 servers had an urgent need to simplify their overall infrastructure and reduce IT sustainment costs. Solution: Guided by a ‘best practice’ server consolidation methodology, our consultants completed a global inventory of all servers to identify server functions, business users and overall utilization. 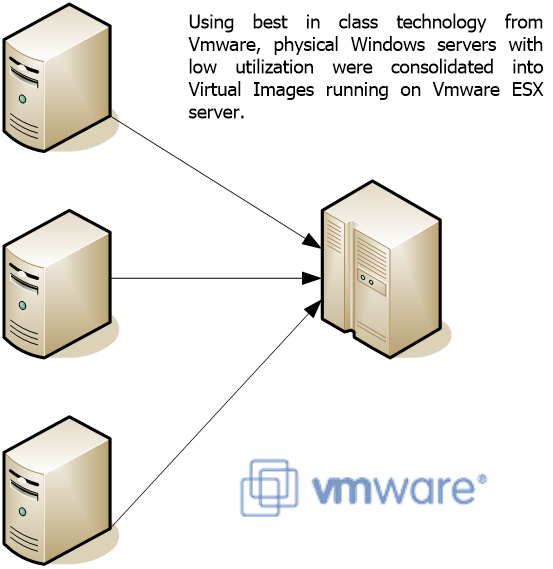 Using a state of the art VMWare solution, our team consolidated hundreds of servers from multiple locations into just 2 regional centres. Benefits: Every physical server that was turned off saved the company c. £1,200 annually. The introduction of virtual technologies to the business achieved a 20% reduction in the server farm, giving an annual benefit to the business of £240K.